Wood has traditionally been used to enhance a home's exterior. Fascias, bargeboards, soffits, and cladding - it's surprising how much timber there is on the outside of most houses. 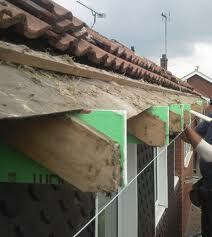 Wood is a good product but is affected by weather, meaning the need for painting and repair. The introduction of UPVC Roofline products came about primarily to reduce maintenance, and is now a very large Industry that has seen many changes in products, installation techniques, Health and Safety legislation and Codes of Practice. Among the major factors in FSB installations includes the fact that the majority of the work done must follow Working at Heights regulations and that there may be asbestos present. The range of colours and finishes along with the vast array of joints, trims and fixings available make the need for correct selection and installation more important than ever before. The Level 2 qualification in the Installation of Domestic Fascias, Soffits and Bargeboards is not suitable for overcladding or cloaking work.